Raw power. Dark betrayal. A family shattered. On a world where a frothing river of magic underlies the land, Crystalyn may become Astura’s greatest power if she can master her ability of using symbols though she seeks no glory. She wants only to find the dear sister she raised; the sibling she lost on another planet by her own doing. Dark Users of magic, political Light Users, and a horde of deadly creatures stand in her way. But when had it ever been easy for one afflicted with an unbalanced, broken mind? 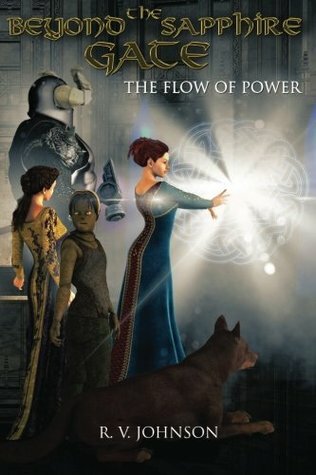 The epic first book in the thrilling Flow Of Power fantasy saga! I really enjoyed reading this book. It was a welcome change from the books that I have read. A change that was definitely needed. The world-building in this book was beyond fantastic. This was not a one-dimensional word. It was a three-dimensional world. It was like an onion. When one layer was peeled back, another aspect of the world was revealed. Which is what made is such a good read. You never knew what was going to be revealed and that, along with other things, kept me glued to the book. I did like small twist towards the end of the book about what Astura was. The way the author explained it was fantastic!! Crystalyn had to be my favorite character in the book. From the beginning, when she was studying the book with symbols to her journey to Surbo, where the Circle of Light is, she was spunky and wanted to do things her way. When it was decided that she would go to Surbo with Lore Mother, Lore Rayne, Cudgel, Hastel, and Atoi, she started to find out that she could use her symbols in new ways….from healing to defense to attacking. But using them came with a price. I also loved her fascination with Darwin Darkwind. He was a bad boy (I think). Also, I loved Broth. Just saying to have a bond mate who could talk to you in your head is pretty sweet. Jade was my other favorite character. She was unfortunate enough to end up in the Dark Citidal. Actually in an armory, of all places. She meets Cameo shortly afterward and he decides that he would help her escape after she told him what images she could see in his aura. I think Jade might have had it a bit rougher than Crystalyn about how bad her journey was. Jade had to crawl through a sewer to escape…..yucky. Cameo wasn’t a joy to travel with either. He was so distrusting of her and Burl it wasn’t even funny. It was only when Burl saved both of their hides, that he was coming around. I wish Garn was featured more in the book and that he was reunited with his daughters at some point. But, I can see why the author chose not to do it and I do hope that he is reunited with his girls in the next book. The fantasy/sci-fi element was very well written. The magic usage in the book was either very subtle or in your face, depending on who was using symbols. Crystalyn’s magic was in your face while Jade’s was more subtle. It was those differences that kept me glued to the book. I also liked that while there were deadly magical creatures, they weren’t all over the book. The wraiths and spiderbees were really the only ones that were detailed. To be honest, the spiderbees scared me. The end of the book was a bit of a shocker. I was not expecting certain things and when they were revealed it did throw me for a loop. I do have some questions and I hope that they will be answered in the next book!! Why: This is a very well written fantasy that I got really into reading. While I did put the book down, I really didn’t want to. I needed to know what would happen with Crystalyn, Jade and everyone else. Why: Violence. Otherwise, it is a very clean book. There is one kissing scene and a couple of scenes where Crystalyn is very aware of Darwin but nothing that would hold me back from allowing a 13-year-old to read.